Glyphosate is the most widely used postemergence herbicide in landscape plantings for several reasons. First and foremost, it is effective. Glyphosate is a systemic (translocated) herbicide that moves from the treated foliage to other plant parts, including the roots. In this way, glyphosate kills annual and perennial weeds. Glyphosate is non-selective. This means a single herbicide can be used to control most weeds – grasses, sedges and broadleaves. Glyphosate has little or no soil residual. It is rapidly bound by clay particles in the soil rendering it inactive. This means you can spray weeds beneath shrubs and trees without damaging the desirable plants – as long as you keep the spray off on the weeds and off of the shrubs. Glyphosate is relatively inexpensive – compared to other herbicides. And, until recently, it has been considered to be one of the least toxic and environmentally benign herbicides in use. However, recently the toxicity and environmental safety of glyphosate has been questioned, And, though the US Environmental Protection Agency continues to maintain that glyphosate does not pose a threat to human health or the environment when used according to directions, many agencies and individuals would prefer an alternative. The question many are asking is: “what can I use instead of glyphosate?” The answer to this question will depend upon the weeds you are trying to control. Seedling annual broadleaf weeds can be easily controlled with other herbicides and herbicidally-active natural products, or even with a hoe or other tool. Perennial weeds, established annual weeds, and grasses are more difficult to control. Regardless of the method or product chosen, the cost for removal will be higher than with glyphosate. This will result from higher chemical costs, more applications, or higher labor costs. Many options are available to control small broadleaf weeds. The best alternative is to prevent the weeds from emerging by using mulches and sanitation practices that prevent the introduction and spread of weed seeds. Preemergence herbicides may be used to control annual grasses and small-seeded broadleaf weeds. However, even in the best-managed landscapes, some weeds will germinate and establish. These weeds will need to be controlled, manually or with postemergence herbicides, before they go to seed. There will always be some hand weeding in landscape plantings. Remove weeds before they have a chance to establish a large root system and before they go to seed. This is best accomplished with frequent weeding – about every 2 weeks. Hand weeding frequently is effective for annual weeds but can also control perennial weeds before they become well established. The limitations, of course, include the expense and availability of labor to do so. Heat can kill seedling broadleaf weeds. Flame weeding is effective on seedling broadleaf weeds growing in hardscapes but should not be used in areas where flammable mulching materials are present. Sites where flame weeding may be practical include cracks in driveways, between pavers, or in gravel mulch. When using a flame weeder you do not need to actually burn the weeds. A brief exposure to the flame will heat the water inside the plant without flames. The leaf tissues will collapse very rapidly after treatment. Larger weeds will require repeated treatments. Flame weeding will provide only foliar damage to grasses, perennial sedges and perennial broadleaf weeds. These types of weeds re-grow rapidly following treatment. Where flammable materials are present, steam or hot foam weeding are preferred over flame weeding. The effect is similar to that of flaming. Commercial equipment is available that use pressurized steam (e.g. WeedTechnics™) or hot water + foaming agent (e.g. FoamStream, Weedingtech™). These machines remove the hazard of fire but do use about 60 gal of water per hour of use. Also, the output from these devices is HOT and accidental contact with the foam or steam can cause severe burns. Several other non-selective herbicides are available for use in landscape plantings. These include: Diquat (Reward™), pelargonic acid (Scythe™), glufosinate (Finale™ and others), and many “natural products” such as vinegar and botanical oils. All of these products have contact-type activity. That means they do not translocate to the roots of treated plants. If applied at the labeled dose and with thorough spray coverage, each of these herbicides will control seedling annual broadleaf weeds. None of these products have residual activity (i.e. : no root uptake and no preemergence weed control) in soils. Glufosinate (Finale™, Bayer Corp.) is a non-selective, postemergence herbicide that is sometimes described to be a contact action but is “locally systemic” – meaning it moves within treated foliage but does not translocate throughout the plant. Thus, Finale typically does not control perennial weeds (such as: bindweed, goldenrod, bermudagrass, and mugwort) as well as glyphosate. Yet, reduced translocation of Finale may offer advantages over glyphosate in some trim and edge applications and in landscape beds where one may avoid systemic damage to landscape ornamentals from inadvertent spray drift. Like the other postemergence herbicides described above, glufosinate has little or no potential for root uptake when applied to the soil. Pelargonic acid (Scythe™, Gowan Co.) is also a postemergence, contact herbicide that controls small seedling broadleaf weeds but only injures larger annual weeds and perennials. In cold weather, Scythe is not as effective as Reward, but in warm weather Scythe provides very rapid weed control. Advantages of Scythe include very rapid symptom development (tissues show symptoms in less than 30 minutes), and Scythe™ is perceived by many people to be an alternative to traditional herbicides. Customers who do not wish to have pesticides applied to their properties will sometimes accept the use of soaps (such as insecticidal soaps) and may accept the use of Scythe, often considered to be a "herbicidal soap." However, users should know that Scythe is not a certified “organic” option. Similar herbicidal soaps are available which are organic certified. As with Reward, spray drift on desirable plants will cause cosmetic damage but will not translocate to kill the entire plant. In all applications, avoid contact with desirable vegetation. The main disadvantages for Scythe are higher cost and it is somewhat less effective than Reward on larger weed seedlings. Additionally, the odor is persistent and offensive to some people, and spray drift can be a severe eye irritant. Several OMRI-certified nonselective, contact-action herbicides are available in the marketplace; some of the more commonly-used products are described below and summarized in Table 1. These products generally contain one or more of the following ingredients: fatty acids, acetic acid (vinegar), or natural plant oils. Ammonium nonanoate (Axxe™) is an OMRI certified formulation of pelargonic acid, the same active ingredient as Scythe. Its performance is understandably nearly identical to that of Scythe. FinalSan™ is a mixture of fatty acid soaps with similar contact-activity. Suppress™ is an emulsifiable concentrate of two short chain fatty acids (caprylic and capric acid). These products are fast acting, contact-action herbicides destroying the integrity of the leaf surface and cell walls. They work in the same way that Scythe™ (pelargonic acid) does. But unlike Scythe, Suppress, Axxe and FinalSan have been approved by OMRI for use in organic agriculture and horticultural operations, including in and around landscapes. Suppress is less active when the carrier water pH is greater than 6.0. If water used to dilute the spray has a pH higher than 6.0, the addition of an acidifier like Biolink™ to the dilution water before mixing will improve product efficacy. Many product formulations containing acetic acid (vinegar) and various botanical oils are available through commercial and retail distributors. These products are non-selective and have contact action similar to fatty acid herbicides. They are effective on seedling annual broadleaf weeds but only burn the foliage of perennial weeds, large annual weeds and grasses. Complete spray coverage is important to obtain optimum results. Symptoms are rapidly visible – within an hour on a sunny, warm day. Users should remember that “natural” does not always mean “safe”. Most products containing vinegar and natural oils have higher dermal toxicity than synthetic herbicides and may carry a “Danger” signal word on the label (Table 1). When using these natural products, avoid contact with skin or eyes, and avoid inhaling spray fines. Contact-action herbicides, including OMRI-certified products, can be effective post emergence tools for small annual broadleaf weeds. They are less effective on grasses and sedges and, at best, will only knock down the top growth of perennial weeds. Still, with regular repeat applications, these products can be useful postemergence tools. Without glyphosate, controlling perennial weeds will be more difficult and will require a more diversified selection of control options. Perennial grasses can be controlled with selective herbicides (described above). Sedges can be controlled with directed applications of sedge-specific herbicides. Established broadleaf weeds (including woody weeds) may in some circumstances be control with synthetic auxin herbicides. And, manual removal will be part of each weed management plan. Sedges are generally not well controlled by contact-type herbicides. However, other herbicides are labeled for use in landscape plantings for postemergence control of annual and perennial sedges. The three herbicides most commonly used for this purpose are bentazon (Basagran TO™), halosulfuron (Sedgehammer™), and sulfentrazone (Dismiss™). Each of these herbicides can damage landscape plants if treatments contact the foliage. Thus, they must be used as though they are non-selective, avoiding contact with desirable plants. Bentazon is a postemergence herbicide that controls yellow nutsedge, most annual sedges, and some seedling broadleaf weeds, but does not control purple nutsedge. Multiple applications at 10 to 14 day intervals are necessary to achieve acceptable control. Halosulfuron controls both yellow and purple nutsedge, and a few seedling broadleaf weeds. Reapply when regrowth is observed, typically 4 to 6 weeks after the initial application. Sulfentrazone is more effective on yellow nutsedge but will suppress purple nutsedge, morningglory seedlings and some other broadleaf weeds. Re-apply when re-growth is observed. Follow the hyperlinks for more detailed information about each of these herbicides. Perennial broadleaf weeds are not well controlled by contact-type herbicides that just burn the foliage but do not translocate to the roots or other shoot tissues. Repeated applications of contact-type herbicides can provide seasonal suppression and enough applications can exhaust the plant’s ability to recover. More effective means of control may be to manually remove the weeds (root and all), smother the weeds with black plastic, or to use a synthetic auxin herbicide. Perennial weeds that do not spread by rhizomes or stolons may be manually removed with a shovel or weed wrench. The shovel is fairly self-explanatory. Dig up the weedy plant by the roots, removing as much of the root mass as is feasible. A weed wrench is a useful device to remove woody weeds such as tree saplings or woody shrubs. The weed wrench uses leverage to firmly hold the base of the weed then lift the weed, roots and all, from the ground. These devices are not effective on herbaceous perennials or on woody weeds that spread by rhizomes. Some weeds are well controlled by cultivation. Tap-rooted perennial weeds, such as dandelion or curly dock, do not survive repeated cultivation. Some rhizomatous weeds with large, shallow rhizomes (such as Japanese knotweed or goldenrod) may also be controlled with repeated cultivation. However, you must continue cultivation when re-growth is observed. And, you must cultivate the entire infestation. 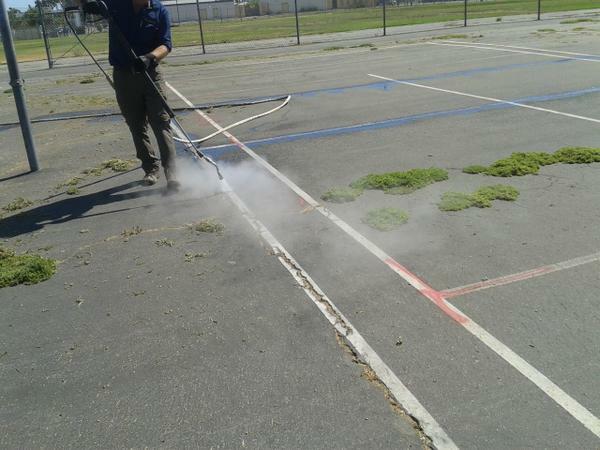 Leaving a non-treated area will result in re-infestation of your treated site. Some synthetic auxin herbicides can be used in landscape plantings to control perennial broadleaf weeds. Clopyralid (Lontrel) is a synthetic auxin herbicide particularly effective for the control of legume and aster weeds, such as vetch, kudzu, thistles and horseweed. It is labeled for directed applications around many woody landscape plants. But, use this with caution. Small amounts of this herbicide can cause severe damage or death of ornamental plants in the aster or legume families, even from root uptake. Some formulations of triclopyr (several trade names) are labeled for control of woody weeds in landscape plantings. This herbicide is particularly effective for controlling poison ivy and brambles. But it can also be very injurious to ornamental plants, so the user must be cautious not to contact desirable plants with the spray applications. Triclopyr is typically applied to the foliage of actively growing weeds. However, it is also effective when applied to freshly cut stems. Cut the weed close to the ground then apply triclopyr to the freshly cut stem, wetting the entire cut surface and base of the weed. Although there are effective alternatives to glyphosate, each of these alternatives will be, in some way, less effective, less convenient, and / or more expensive. Contact herbicides will be less effective on larger weeds requiring multiple applications. Natural product alternatives will be significantly more expensive. Selective postemergence grass herbicides will be convenient but more expensive and do not control broadleaf weeds. Synthetic auxin herbicides are effective on perennial broadleaf weeds but may result in damage to desirable plants through either spray drift or root uptake. Mechanical controls or hand removal will be labor intensive and expensive. Many landscape maintenance professionals have grown reliant on glyphosate for weed control. Landscape weed control without glyphosate is certainly possible but will require more planning, careful consideration of alternative treatments, more frequent site visits, and higher costs. But, it can be done. * Always consult the label for details. But, even when not required by the label, the authors recommend wearing water proof footwear, eye protection, and chemical resistant gloves when applying pesticides. † Commercial sales and use are not allowed in Suffolk and Nassau Counties, NY. The authors thank Drs. Cheryl Wilen, University of California Cooperative Extension, and Chris Marble, University fo Florida, for their helpful review and contributions.